If you have just a handful of Copic markers or your are looking to start a collection of Copic markers this blog post and video is for you. About a year or so ago I shared a blog post over about my favorite Copic Marker Color Combos, that post has gotten thousands of views ever since and I’ve had a lot of people reach out to me and thank me for that information. I’ve been meaning to turn that post into a video and expand upon it to share even more useful info and I finally have. I don’t have a lot of Copic markers and most of the markers that I have I’ve grouped into combos that work for me and help me have great coloring results every time. I am not a certified Copic instructor, I simply enjoy using these markers to color my stamped images. I am not a pro and I still have a lot to learn. But I do have favorite color combos that work for me and I’m happy to share them with you. I bought my first Copic markers on Ebay a few years ago, those were used markers and there were about 50 different colors; not all colors worked well together; many I ended up not using at all and I still do not use them. Over the years I bought a few additional colors to grow my collection. I have 101 marker today. Do I feel I have enough to color? Yes, absolutely. Do I want to get more colors? Yes, absolutely, but I’m sticking to those I have for now unless I come across some fantastic color combo that I simply must have. My point is, you don’t have to have a lot of colors to do nice coloring. Just pick what works for you and get those. How do you know if you’ll like the Copic colors before you get them? If a friend of yours has Copics, have a play-date. See what colors you like, write them down. Look for Copic Color Combos online. I love to search for those on Pinterest. You’ll be surprised – there are so many different suggestions and images to choose from. Not all of them will work for you, but at least it’s a place to start. 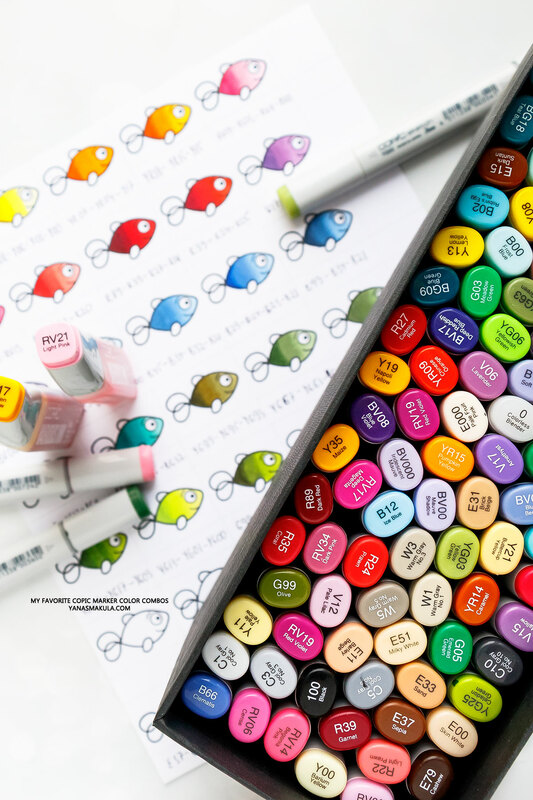 You can also look for color combos on various crafting blogs and check the descriptions and supply list – I for example always try to list all of the Copic marker colors I used to color a specific image. See all blog post that feature Copic coloring HERE. If you already have a small collection of Copics I suggest you create a color combo chart. You might already have a regular Copic marker chart or a hex chart but having a color combo chart is also helpful especially if you like to use the same colors when you color. For this you’ll need to pick a simple outline image, measure it and based on its measurements create a grid on a sheet of cardstock that you usually use to color on. Most of my combos have 4 markers to them. I rarely use all 4, most of the time I would just use 3 and would skip either the lightest or the darker marker. Having a chart like this on my desk is super helpful. When I go to color something I don’t have to try and remember what colors I used last time that worked and I don’t have to try and test my colors to see if they would work. I already have my chart and I can quickly see my favorite marker combinations. This of course doesn’t prevent me from trying to find new combos from time to time, but I do for the most part use my documented copic marker combos. If you like to color on other colors of cardstock, for example some people like to color on Kraft – you can create a chart like this on kraft as the marker colors will be different compared to the colors of white paper. I hope this blog post & video has been useful. 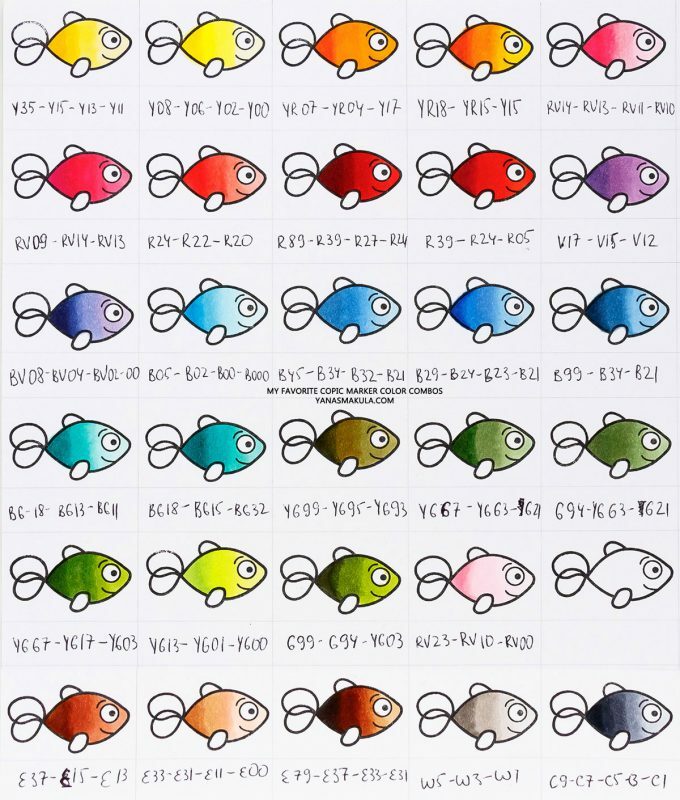 Let me know in the comments below if you are going to create a chart like this or if you already have one and also if you have your favorite Copic marker color combos. Feel free to save this image to one of your boards on Pinterest to easily find it later! Hi Yana, Awesome video, so helpful. I am a Copic girl!! I love the chart you made, I didn’t catch the name of that stamp set you used in video and I didn’t see a link for it, could you let me know what that was? I just love your blog, I have been a long time subscriber and so enjoy your blog. Your coloring ALWAYS amazes me, I can not believe that you are not a Certified Copic Instructor, you are such an AMAZING colorist and artist. I have learned so much from you, and I Thank you for that. thanks, Kathleen! I appreciate it. This is a great resource! I love to organize like this and then I also know what I want to get the next time I make a purchase. Thanks for sharing – I’m just starting in Copics/alcohol and it’s great to see good combos ahead of time so I don’t have to do all the trial and error. I love the concept of making a color combo chart! In fact, I looked tor a download to work with. Any chance of that? sorry! I can’t make it into a download as I do not own the fish image. Hi Yana. Thanks so much for this video. I have been collecting copics for several years and love them. I have a hex chart that I use for colour combos but like how you have done your combos. Any chance you would put your combos so we could print it off. I have printed off your list but having the chart would be such a big help. I have been a subscriber to your posts for quit awhile and look forward to seeing what you are doing. Always great!! hey Marian! hmm, I think I can do this. It will take me some time to put together, but I’ll give it a go. Thanks so much – this would be a great help. This is such a great idea. Thanks for posting the process! Now to find a similar open stamp in my stash, to illustrate this idea for my chart! Thanks Yana for coming up with this combo list. I’m going to go and watch your video on youtube-with my feet up, in my family room. You are awesome. to make myself a color combo chart. I LOVE to color too! I’m always looking forward to your next video!! Yana, this is so very helpful to make sense of all of the colour combos I have compiled for my Copics. Now I will be able to put the finishing touches on my Copic findings in a format that is easy to access and also gives me a visual of the “letters & numbers”, if that makes sense. Yana, thank you for sharing such an awesome idea. I’m a beginner with Copics & this will be really helpful when I’m trying color blending/ combos. I always enjoy watching your coloring videos, thanks again for sharing your talents. Great chart – I am a beginner and going to create this chart TODAY. I have about 50 colors and this will help me clarify what I would like to add to my collection. Thank you! Hello Yana, this is my first visit; Cathy Z sent me your way from her post today. I was intrigued, so I popped on over and I’m SO GLAD I did. I LOVE this chart. It never occurred to me to do something even remotely similar. Such a clever idea; going to subscribe and look around your site now. Thank you again. 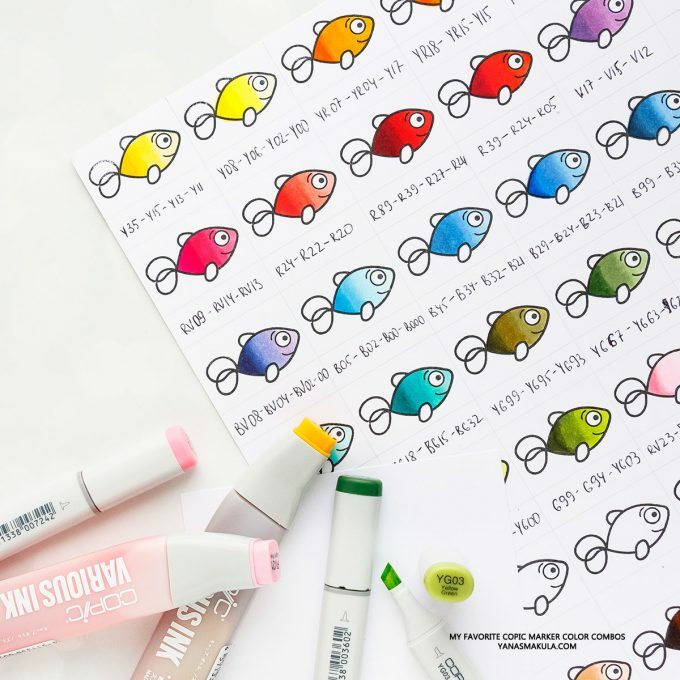 Yana, when you color these do you go lightest to darkest color or do you follow the order of your colors that are listed under the fish from left side to fight side? For example, E00, E11, E 31, E33. But under the fish it is listed in reverse order. I really like this idea and I am so glad you showed us a tutorial on it! Thank you for sharing and giving us fuel for our creative fires!!!! Dear Yana, Your video “My Favorite Copic Color Combos (UPDATED! )” is very helpful. 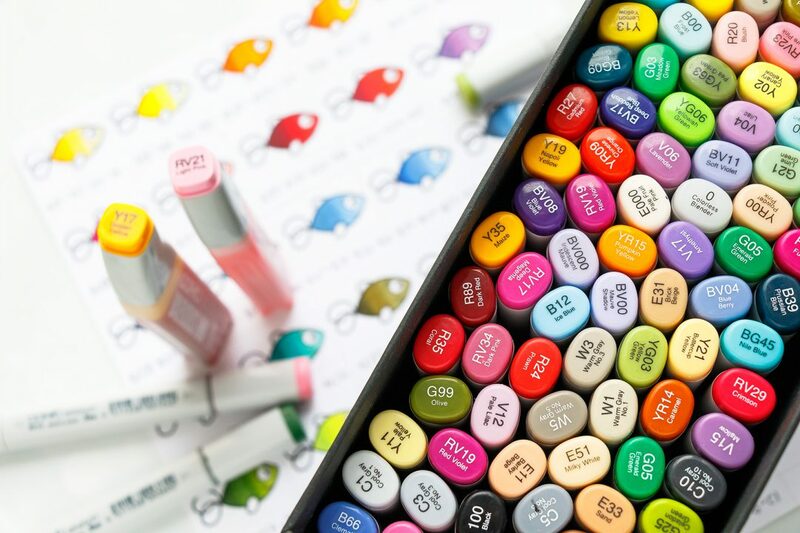 Reluctant to invest in the expense of Copic markers due to all the decisions surrounding color choice for a beginner, how to group the colors for the best use, and how to make the best use of a wonderful product. Your video gives me the confidence to move forward. I have now purchased my first set of Copic markers based upon your “go to” Copic marker combos, and I look forward to happily using them in card-making.